Has your server been configured with the memory required to perform as its role expands over time? HPE Server Memory is designed for SMB and enterprise customers with a significant need for performance and capacity along with a desire to manage TCO. HPE SmartMemory offers the widest selection of memory types and capacities, enabling total server memory optimization, runs at top throughput speed and is amongst the most power-efficient memory available. In addition to performance and efficiency, HPE SmartMemory also delivers on reliability. Only the highest-quality DRAM modules are selected from top suppliers. 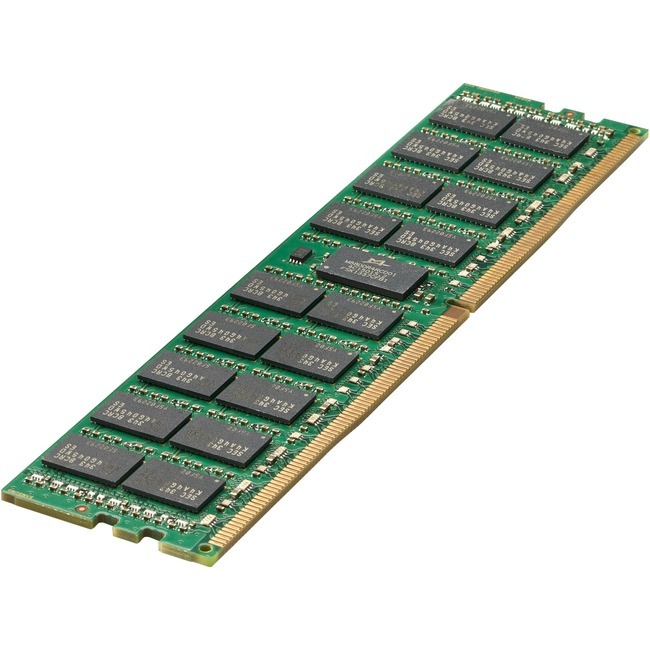 Now more than ever, DRAM quality is critical, as data center trends such as server virtualization, cloud computing, and the use of large database applications, have increased the need for higher-capacity memory with greater uptime. HPE SmartMemory undergoes rigorous qualification and testing processes that unlock memory performance features available only with HPE Servers. Up to 64 GB DDR4-2666 MT/s memory options supported on HPE Gen10 servers. HPE DDR4 2666 MT/s server memory provides up to a 66% improvement in bandwidth at DDR4-2666 MT/s in comparison to DDR4 2400 MT/s memory modules. Delivers up to a 4.7% improvement in latency at DDR4-2666 MT/ s in comparison to DDR4 2400 MT/s memory modules. HPE DDR4 SmartMemory modules have been tested and qualified on all Hewlett Packard Enterprise server platforms to deliver the highest level of signal integrity. Prevents unnecessary DIMM replacement and reduces server downtime with advanced memory error detection technology. Hewlett Packard Enterprise server memory is made of the highest quality materials, reducing issues that may affect signal integrity, increasing system reliability. Hewlett Packard Enterprise server memory speed targets provide customers with memory that performs above industry standards, allowing them to increase performance without having to increase the amount of memory purchased. Number of Pins288-pinForm FactorDIMMThickness750 milWidth3.5"Length7.8"